Ready to book your appointment? 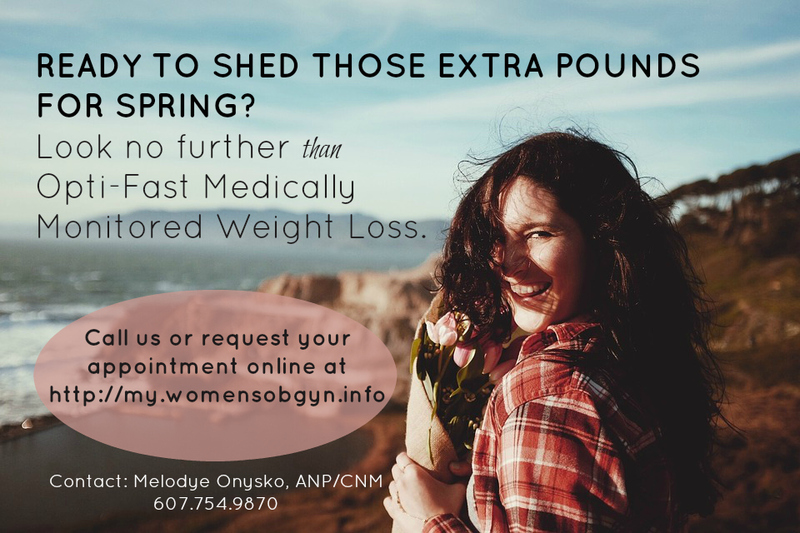 Click Here to get started, or call 607.754.9870 today! Melodye Onysko ANP/CNM offers Greater Binghamton’s only medically monitored weight management program with Optifast. The program in our practice helps overweight and obese women lose weight and use a weight maintenance program to provide patients with expert resources to address, modify and support lifestyle, behavior and diet decisions. OPTIFAST: The medically monitored OPTIFAST weight management program has been proven in more than 80 clinical studies to help overweight and obese people lose weight. The typical OPTIFAST patient loses over 50 lbs in 18-24 weeks, and experiences a healthy decrease in blood pressure and cholesterol levels. Additionally, 50 percent of patients assessed five years after completing the OPTIFAST program kept enough weight off to improve their health long term. Advanced Body Composition Analysis: Advanced Body Composition Analysis uses a technique called DXA (Dual-energy X-ray Absorptiometry). This technique has been available for many years to assess bone density to test for osteoporosis, and has recently been applied to body composition. DXA is now the gold standard for measuring body fat % and body composition. Check out the video below explaining Advanced Body Composition. Nutritional Supplements: Supplements available to patients in our practice include quality nutritional formulas to fully support people so they can pursue their best possible health.